1. Produced in Kijoka Ogimison Kunigamigun, Okinawa Prefecture. 2. 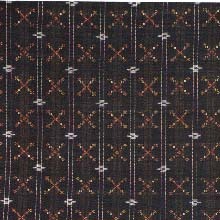 Characteristics: Fabric woven with fibers taken from "Ito Basho"(Musa liukinensis). Lighter than hemp, stiff, strong, dry and air permeable. Designs are mostly splash patterns. 3. Uses: Clothing, sashes, bedding, handbags, small items. 4. History: As the area was full of "Ito Basho," "Basho(banana plant) Fu(cloth)" was being woven in the Amami Islands and Yonaguni Island from old days and the fabric had been used for formal and everyday clothes without any discrimination of social status. It was woven already in the 13th or 14th century judging from the fact that it was listed as one of the tributes to Ming Dynasty (in China). 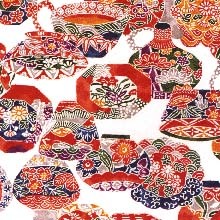 It was the most popular fabric representing Okinawa. In 1609 the feudal government of Satsuma (Kagoshima) invaded Ryukyu(Okinawa) and ordered her a tribute to the lord, in which 3,000 rolls of "Basho Fu" was listed. Designs were mostly stripes and check then but splash patterns became the main design since 1896 when a woman started weaving the patterns. "Basho Fu" was the representative fabric of Okinawa but it was utterly unknown by outside people. Production increased in the Meiji Period as a result of the introduction of "Taka Hata"(high loom) and technical developments. However, the fabric was used only in Kagoshima Prefecture. The production was completely ceased in the years of American rule just after the WWII. An association established in 1956 has tried to produce various kinds of "Basho Fu" and made it well known. It was designated as the "Important Intangible Cultural Property" in 1974. 1. Dyes are "Ryukyu Ai"(indigo) and "Techika"(usually called "Sharinbai" or "Techiki"), both growing in Okinawa. 2. 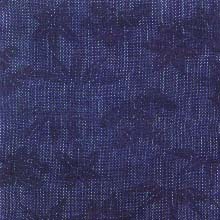 The color of the fiber of "Ito Basho" makes the background in which splash patterns are woven in indigo and light brown. 3. 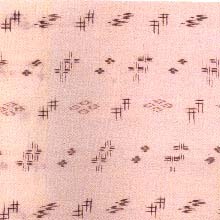 There are 4 kinds of "Kasuri" designs: "Tate(warp) Kasuri," "Yoko(weft) Kasuri," "Tate-Yoko Kasuri" and "Aya(twill) Naka(center)." 4. Threads are tie-dyed manually using no pattern sketch. 1. Produced in Yomitanson Nakagamigun, Okinawa Prefecture. 2. Characteristics: Fabric with raised designs of flower or geometrical patterns in which 5 pre-dyed threads are used. Color is restricted to 5: dark blue, white, red, yellow and green. 2 kinds of techniques are used to produce figure designs: (1) "Tibana(hand flower) Ori(weave)" or "Nuitori(embroidery) Ori," a technique to weave in the colored threads only in the design, (2) "Hiyai(heddles) Bana(flower) Ori," a technique to produce a raised design using heddles. Designs are 30 and more kinds of geometrical patterns based on 3 flowers: "Jinbana," "Ojibana" and "Kajimaya" ("Kazaguruma," Clematis patens). Other designs are combinations of the above with splash patterns, stripes and checks. Fabrics are mostly cotton but occasionally mixed with "Basho," hemp or silk. They are all dyed with plant dyes. 3. Uses: Clothing, "Minsa"(undersash), handkerchiefs. 4. History: It is presumed that the fabric was originated in and transmitted from Southeastern countries such as Thailand, Myanmar(Burma) and Java(Indonesia). About 550 years ago, the fabric was designated by the Ryukyu Dynasty as specific cloth which aristocrats in Shuri (the capital of Ryukyu then) and the people in Yomitan only could use. Although prohibited for use by other people, it had been woven until the Meiji Period. But production ceased in the late Meiji to Showa Periods. It was revived in 1964 under the guidance of the village office and has been popular as a traditional handicraft. 1. Produced in Nakasatoson(Kume Island) Shimajirigun, Okinawa Prefecture. 2. Characteristics: High quality silk fabric hand woven in "Taka Hata"(high loom) and fulled by block, with hand spun "Tsumugi"(pongee) threads dyed with plant dyes and treated with mud mordanting. It has deep color tone and is soft and gentle. There are 3 kinds: black, white and colored. 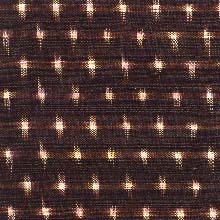 Designs are stripes, checks, warp-weft Kasuri(splash pattern), weft Kasuri and combined patterns of the above. 4. 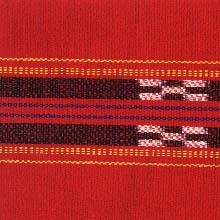 History: It is surmised that the Kasuri weaving technique originated in India and came to Okinawa in the 14th or 15th century as Okinawa was in trade with Southeastern countries since old days. At the same time, Okinawans developed sericulture in Kume Island, where mulberry grew better than in other islands, producing silk fabric. "Kasuri" fabrics here with the quality of "Chusara"(Okinawan expression meaning "fresh, cool and beautiful") developed into "Kumejima Tsumugi," the oldest Kasuri fabric that gave strong influence upon Kasuri fabrics produced in many districts in mainland Japan. "Kumejima Tsumugi" was originated in the middle of the 15th century when a local man studied sericulture and the spinning technique in China (Ming Dynasty then) and brought them back here. In 1619 a man named Somai Sakamoto in Fukui Prefecture transmitted the techniques of growing mulberry, sericulture and floss silk production by the order of the ruler of Okinawa. And in 1632, a Satsuma warrior (in Kagoshima Prefecture) transmitted the mud dyeing method in Hachijo Island, thus absorbing many techniques. 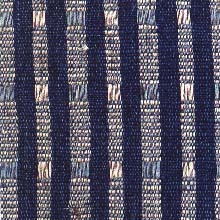 "Kumejima Tsumugi" became one of the first class fabrics in Japan. After the Satsuma invasion in 1609, "Kumejima Tsumugi" was designated as an item for capitation (or poll tax), tax fixed at an equal sum per person. It was shipped to Edo(Tokyo) via Satsuma and became popular by the name of "Ryukyu Tsumugi"(pongee in Okinawa). Specific designs based on those in a designated pattern book were strictly observed for the Tsumugi which was used by the local ruler. The restriction contributed much to the technical development, bringing refined and beautiful fabrics. Dyes come from the plants which grow in the fields and hills in the island. They are "Guru"("Sarutori Ibara," Sumilax china), "Techika" ("Sharinbai," Raphilolepis umbellata), "Kurubo"(Okinawan persimmon, Diospyros kaki), "Yamamomo" (Myrica rubra) and "Yuna" ("Ohamabo," cotton tree). Five basic colors in "Kumejima Tsumugi" are dyed with the 5 dyes above. (1) Dark brown("Koge cha") is produced by first dyeing the fabric with "Guru" and "Techika" and then mud-dyeing it. (2) Yellow: First dyed with "Kurubo" and "Yamamomo" and then mordanted with alum. (3) Reddish brown ("Aka cha"): Dyed with "Guru" and Techika," and then mordanted with alum. (4) Brownish green ("Uguisu"): Dyed with "Kurubo" and "Yamamomo" and then mud-dyed. (5) Dark gray ("Nezumi"): Dyed with "Yuna" and mordanted with "Gujiru"(juice of ground soy beans). 1. Produced in Haebarumachi Shimajirigun, Naha City, Okinawa Prefecture. 2. Characteristics: Cotton fabric dyed in indigo with "Kasuri" design. Tough and resists fading. Designs are everyday articles, stars, clouds and birds all stylized. In Okinawa, "Ryukyu Gasuri" is understood as denoting all Kasuri fabric produced in Okinawa. 4. History: Regarding the origin of Kasuri weaving in Okinawa, some say that it came from the South(Indonesia and other countries) and others say it came from China. Anyway, Kasuri designs were woven in "Basho Fu"(banana tree fabric) in the 14th century and developed in various way in the climate and life style in Okinawa. After the Satsuma invasion, "Ryukyu Gasuri" was imported to Kyushu, in mainland Japan, eventually affecting many fabrics in Japan. 1. Produced in Shuriteramachi Naha City, Okinawa Prefecture. 2. Characteristics: Figured fabric, both silk and cotton, in which warp threads are raised. Two colored threads are used as warp and raised on both sides of fabric, and therefore, they are reversible. 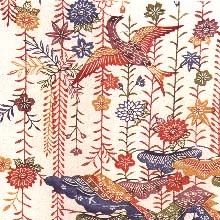 Threads, dyed with plant dyes, are woven in "Takahata"(high loom) and finished with unique fulling. 3. Uses: Clothes for higher class than the warriors. 4. 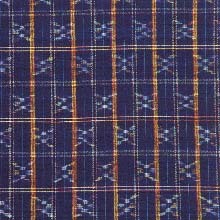 History: The weaving technique of figured fabrics was transmitted from China in 1659. Okinawans produced their own fabrics since that time. The fabric was used for the court and for official costumes of the Dynasty. 1. Produced in Shuritonokura Naha City, Okinawa Prefecture. 2.Characteristics: Silk fabric with designs of checks and Kasuri patterns. 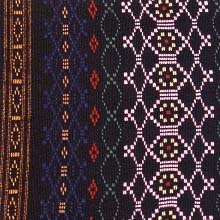 Twisted threads("Mudi") with 5 to 7 colors are used as warp and twisted threads with red-white or dark blue-white as weft. The fabric with red-white colors is used for ceremonial clothes and that with dark blue-white for daily and mourning clothes. 3. Uses: Clothes for women in the royal family and in a higher class than the warrior class. 4. History: The Sho Family united all Okinawan Islands in the 15th century and Shuri (Naha, today) became the capital of the Ryukyu Dynasty and the center of fabrics in Okinawa. The Okinawan Dynasty actively traded with China, Korea, Japan and such Southeastern countries as Siam(Thailand) and Java(Indonesia), bringing foreign influence upon the costumes of the aristocrats. The imported culture was gradually united with Okinawans� own, giving birth to a new style of dyeing and weaving. 1. Produced in Shuri Naha City, Okinawa Prefecture. 2. Characteristics: Silk fabric woven with threads dyed in a primitive way. They are dyed with raw indigo leaves without fermenting them. Designs are checks with Kasuri designs and woven in "Ro"(silk gauze) and "Sha"(gauze). 4. 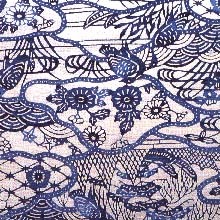 History: The origin is not clear but the dyeing technique has been used here since old days because the fermentation of indigo was first made in the Nara Period (710-794). 1. The indigo color is extracted after raw indigo leaves are dipped in the water with a temperature of 50 to 60 degrees centigrade. 2. Leaves are taken out when the water becomes light blue. 3. Threads are dipped in the liquid, taken out to be squeezed and ventilated well. 4. The above steps are repeated 14 or 15 times. 5. The dyed threads are now tie-dyed with plant dyes to produce Kasuri threads. 1. Produced in Hirara City(Miyako Island), Okinawa Prefecture. 2. Characteristics: Hemp fabric, hand-woven with the hand spun threads of "Choma"(ramie). Threads are mud-dyed in indigo. Quality hemp fabric, hand-woven and fulled. As woven with very fine threads, the fabric is strong, smooth and lustrous. 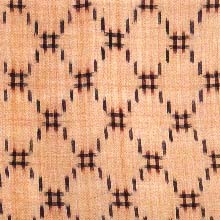 Designs are delicate Kasuri patterns, requiring the weaver 2 months to finish 1 "tan"(roll; quantity of cloth enough for one person). Highest quality fabric for summer clothes, paralleling "Echigo Jofu." 3. Uses: Clothes for summer. 4. History: An authorized historical document in Korea has recorded that hemp fabric was first woven in Miyako Island in 1479. But a delicate fabric was first woven in 1583, when a wife of a weaver, who was promoted to produce a good work by the king of Ryukyu, wove a fabric and presented it to the king. Since then, "Miyako Jofu" was designated as an item to be presented to the dynasty and was diversified, bringing about "Iro(color) Jofu." "Miyako Jofu" became popular throughout Japan after the invasion of the Satsuma feudal government into Okinawa in 1609. The Satsuma government levied a poll tax(capitation) on islanders and designate "Miyako Jofu" as the fabric to be collected as tax in 1658. The Miyako Jofu collected was sent to many districts in Japan and became known as "Satsuma Jofu" throughout Japan. 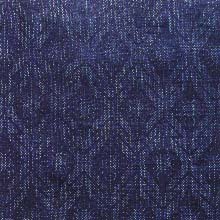 The Kasuri pattern "Jofu" in indigo became the main product here as "Iro Jofu" was not much produced. Influenced by the poll tax, which was levied on all women aged 15- 50 without exceptions of ill or physically handicapped, good quality was kept, but the life for the villagers was miserable because they were forced to work in the watch of village officials. The poll tax system continued to 1903. "Miyako Jofu" was exhibited at the World Exhibition in the United States of America in 1875. The WWII temporarily interrupted the production but it was revived in 1948 and designated as the "Important Intangible Cultural Property." It also included the technique of hand spinning, indigo dyeing and hand weaving. 1. Produced in Taketomimachi(Taketomi Island) Yaeyamagun, Ishigaki City(Ishigaki Iseland) , Okinawa Prefecture. 2. Characteristics: Hemp fabric woven with threads which are dyed(printed) in Kasuri patterns with "Kuru," a plant of the "Yamanoimo"(Diascorra japonica) family. "Takahata"(high loom) is used for weaving and the fabric is bleached in sea water. Fine threads are used and fabrics with lighter threads are regarded as better. 4. History: The origin is not clear but the fabric must have been woven since before 1637 as the name was listed as an item to be collected as tax in the tax document that year. "Cha(light brown) Gasuri" in "Yaeyama Jofu" became widely known through the Satsuma feudal government by the name of "Satsuma Jofu," "Satsuma Shiro(white) Kasuri" or "Sabi(rust) Gasuri." According to the traditional technique, the woven fabric is dried in the sun and then finished by bleaching in the sea water. As the outdoor tasks needed many workers, more than 20 work songs have been left for us by them. The production of "Yaeyama Jofu" increased very much as a result of the abolition of the poll tax in 1903, but declined in WWII. After the reversion of Okinawa to Japan in 1972, young islanders started actively developing the preservation of the traditional technique. 1. Produced in Taketomimachi(Taketomi Island) Yaeyamagun, Okinawa Prefecture. 2. Characteristics: Short width sashes, called "Minsa" with 8.5 cm width and 230 cm length. Cotton fabric of warp rib weave. 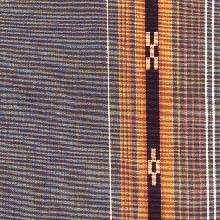 On both sides of the sash, stripes are woven in which one stripes consists of a mass of short horizontal lines. It is called "Mukade(centipede) Moyo(pattern)." On another stripe between some others, the pattern of 5 and 4 square dots is woven in after one another. 4. History: The origin is not clear but "Minsa" is closely related to the act of "Kayoi Kon"(court paying) which has been practiced here until lately. When a man visited a woman at her house, the woman presented this sash to the man with an endearing heart, wishing "Itsu(whose sound means �five�) Yo(�four�) mademo" ("Love me forever"). An allegory is expressed in the sash. In the 2 vertical stripes, a woman�s wishes are put in, requesting that the man be constant and faithful. 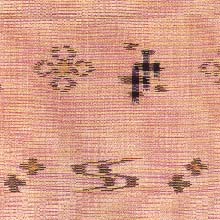 The stripes, in which a mass of horizontal lines are woven, are called "centipede pattern" and are said to express a wish for the man to visit her frequently. Today, not only the indigo dyed "Minsa," but other multi-colored sashes, table cloths and pouches are produced. The Minsa, which is produced in Kobama Island, near Taketomi Island, is called "Ki Ai Zome." "Ki Ai" is an Indian indigo which used to grow much in the Island. Cultivated indigo, however, is used today. The steps in "Ki(literally, tree) Ai(indigo) Zome(dyeing)" are as follows: (1) Leaves of "Ki Ai" are put in the vat with lime water. (2) Fermentation starts in four or five days. Skimming of the supernatant liquid. Moving the settled indigo into another vat. (3) The indigo is again fermented. Threads are dipped and dyed here. 1. Produced in Yonagunimachi(Yonaguni Island), Yaeyamagun, Okinawa Prefecture. 2. 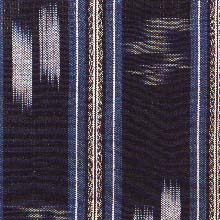 Characteristics: A kind of figured cloth in which 9 wide horizontal stripes are woven with colored threads (of dark blue, red, light brown, yellow, black and so on). Checkered designs appear on both sides. 4. 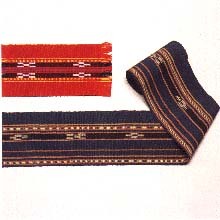 History: As Yonaguni Island is isolated, there was no such fabric as Kasuri which was popular in other islands, but a unique striped fabric developed here. The "Tesaji" was woven as a "hand towel of affection" in which people wished their families safe voyage and travel, and as a "hand towel of love" in which a young woman expressed her love to a man. It was used as a decoration to be put on shoulders or over the head. It was woven with hemp or "Basho" threads in the past but with cotton threads today. 1. Produed in Naha City, Tamagusukumura, Tomigusukumura Shimajirigun, Okinawa Prefecture. 2. Characteristics: A dyeing process producing the designs of birds, or moon with brilliant colors peculiar to a tropical atmosphere. "Bin(vermilion) gate" is a design dyed with some shades of indigo. In addition, there are paper pattern dyeing and cylinder dyeing("Tsutsugaki Zome"). 3. Uses: Clothes for women, "Haori"(half coat), sashes, "Noren"(shop curtains), wall hangings, table cloths, wrapping cloths, pouches, etc. 4. History: The origin is not clear but is presumed to be in the 15th century. 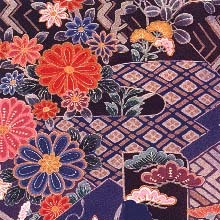 The dyeing is presumably influenced by "urashi gata," a stencil dyeing transmitted from China, and by the dyeing techniques and designs in mainland Japan. As "Bingata" was used for garments for the ruling class in the Ryukyu Dynasty and also used as a trade item, the Bingata technique has been maintained until today by 3 families. In the days of the Ryukyu Dynasty, the color of cloth of the background and the designs were different and based on status. The aristocrats used the "Bingata" of silk crepe or figured satin("Rinzu") with picturesque and multi-colored large designs on a white background or light yellowish color. The common people used cotton cloth with simpler designs dyed in 5 colors or 2(indigo and black) colors. "Bingata" was imported to mainland Japan during1688-1704, and was loved very much. The production decreased drastically after the Ryukyu Dynasty was abolished in 1879 and totally abolished in WWII, revived after WWII. The plant dyes used are "Ryukyu Ai(indigo)," "Fukugi"(a high tree of Hypericum erectum family), "Suo"(Caesalpinia sappan) and "Yamamomo"(Myrica rubra), and as pigment, "Shoenji"(cochneal), "Shu"(cinnabar), "Sekio"(orpiment), "Sumi"(Indian ink) and "Gofun"(aleurone). For the purpose of fixing the color to the cloth, "Gojiru" liquid obtained from ground soy beans, is used with pigment and alum with plant dyes. Plant dyes are painted over the pigment. Only the designs are dyed with resistant being applied on the background, leaving it white. 2. "Sumiji(dyed background) gata"
Both designs and background are dyed at the same time. The resistant applied on the part of the designs which should be white. 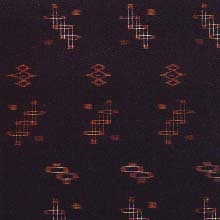 This is a step to follow "Shiruji gata" (1), in which designs are dyed. 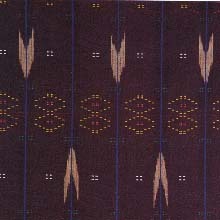 The background is dyed after the resistant is applied on the designs. A technique to give designs to already dyed background with techniques (1) and (2). 5. "Dan Zome Ji gata"
The color of the dyed background is largely divided into 2 parts by a horizontal line. After the dyeing is finished, it is followed by gradation and hand-dyeing. After washing in water, the white parts are colored. 1. 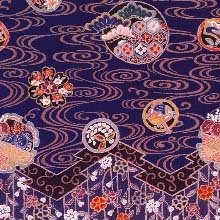 "Shiroji E gata": Designs are all in one tone of indigo on white background. 2. 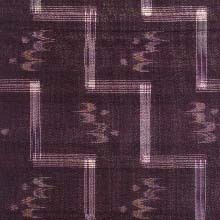 "Asaji Hanatori": Designs with different shades of indigo. 3. 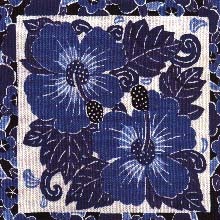 "Kurohana(black flower) dashi": White designs on indigo background. 4. "Shirohana(white flower) dashi": White designs on indigo background. 5. "E Uburu": Double dyeing in indigo with techniques (1) and (2). 6. "Sumiji E gata":Gradation is given to designs with Indian ink. 7. "Bin Iri E gata": Such colors as red, yellow or blue, are added to the indigo part.